Most feel that the pain of working with 3D is the cost of doing business. Recent research shows that doing it well directly affects profitability. Today’s Contract Manufacturers face a difficult business environment. However, few executives realize just how much working with customer’s 3D models directly affect their balance sheet. This eBook looks at recent Lifecycle Insights’ research to put this competency into perspective. This eBook is of most value to Executives in small to mid-sized Contact Manufacturers. It is particularly insightful for those trying to understand how improvements to design and engineering can affect company financials. For contract manufacturers, it’s always been a grueling task to turn a profit. And, unfortunately, it’s only getting more arduous. Tight economic times have made every manufacturer look for opportunities to cut costs. Because contract manufacturers sit at the bottom of the supply chain, customers squeeze every penny possible from them. Furthermore, with fewer bid opportunities and more competition, contract manufacturers have no choice but to get aggressive on their bids and it shows. With margins this thin, contract manufacturers have a lot to lose by dropping the ball. And balls do get dropped. Often. Findings from The PLM Study reveal that only 18% of their development projects go as planned. In the midst of this difficult economic environment, there is an organizational competency that few executives realize directly affects profitability: working with 3D models. Contract manufacturers must get a clean and precise representation of customer data before they can accurately bid on projects. They must design tooling off of it. They must generate CNC machining code from it. 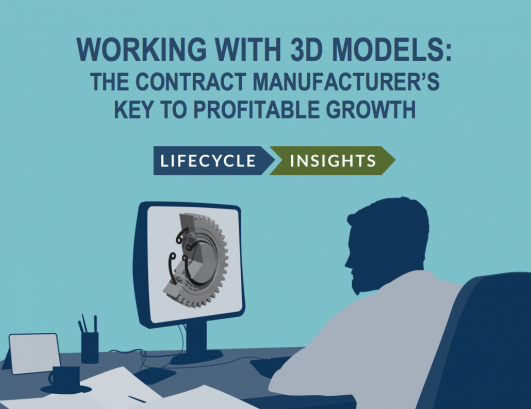 Ultimately, working with a customer’s 3D design data is on the critical path for almost every project a contract manufacturer delivers. Doing this poorly directly compromises the margin reaped from any project.